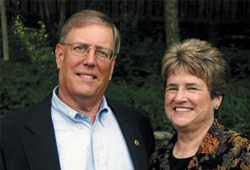 Hayward (Jay) and Carolyn Stickney Beck '65 include Lawrence among their philanthropic priorities with good reason, Jays' family ties to the college are extensive, and they both value their Lawrence education highly. As co-chairs of their 40th Reunion Gift Committee, the Becks learned how important planned giving is to Lawrence's future well-being. Jay, a financial consultant, quickly saw the advantages of naming Lawrence as a beneficiary of a percentage of their retirement assets. "Considering how heavily these assets can be taxed if left to individuals, it makes sense to direct them to Lawrence, where their full value can be put to such good use," says Jay. "The simplicity of changing a beneficiary designation — at no cost — makes this the easiest way include Lawrence in your estate plans." The Becks are pleased their planned gift will enhance the Elmer H. Jennings Scholarship Fund, established in 1975 by Jay's late grandfather, a former Lawrence trustee, to continue a family legacy of helping future generations of Lawrentians.